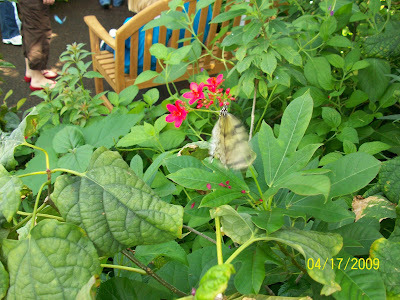 The Butterfly House is supposed to be a fun, stress-free, delightful experience for all children. 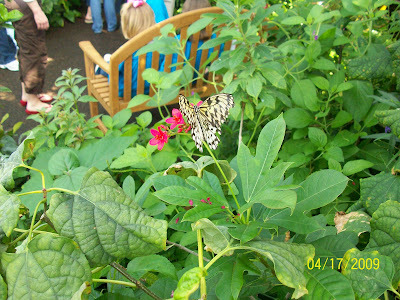 You get to go into a gigantic glass house full of beautiful butterflies. 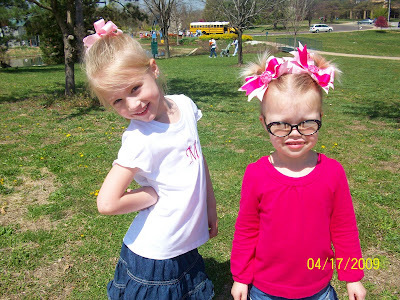 They fly all around you and even land on your shoulder, or in our case, your HAIR BOW. This was not so fun for my Mia. She was calm the first 10 minutes when she ran off with her friends. However, when I demanded she come hang with me and her sisters and take a few pics, she was all the sudden flinching at every butterfly "fly-by" and started to really spaz out. I guess it can be overwhelming. But the whole experience was just so typical. I am without my hubby (stressful, three kids, stroller, purse, lunches). I have Grace in one arm (heavy, workout). I am trying to keep tabs on Sophie (crazy, lots of kids). And now Mia is bawling a little louder with each butterfly flinch. Mortifying (Sweat Drip, Sweat Drip). 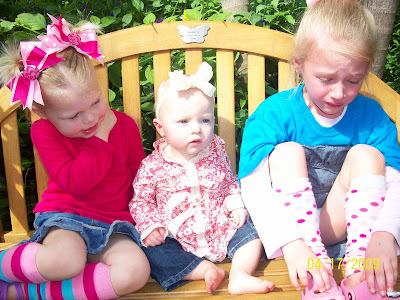 Check out my POSE pics on a bench in The Butterfly House (of pain). You will see where the PAIN fits in. 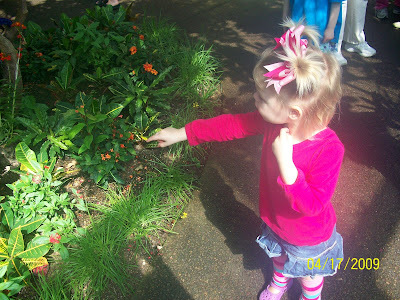 Gracie LOVED looking at the butterflies fly by. The day was not totally ruined. 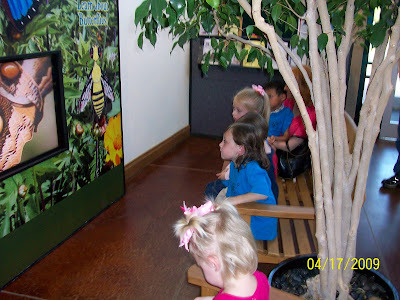 After we escaped the actual STEAMY Butterfly House portion and Mia calmed down, I was able to snap a few cute pics of the kiddos roaming the other areas of the park. A movie about how butterflies are born (graphic). Sophie posing by the Cockroach Display. YUCK! 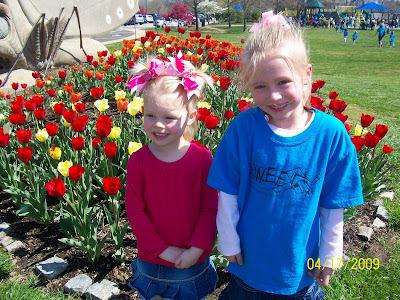 A quick photo op by the beautiful tulips on the way to the playground. And finally, on our way out of the park. What a beautiful butterfly day. 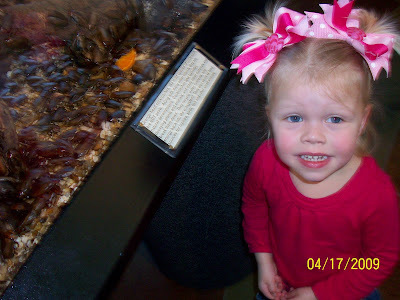 Was that at the STL Zoo or the other butterfly house? 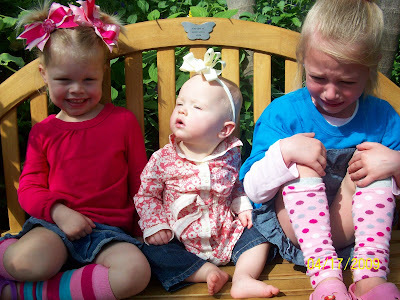 I just heard another Mom I know talk about a melt down her daughter had at the butterfly house. I have never had them do too much fly by bombing at the one in the insectarium of the STL Zoo. Poor Mia. I am not a fan of bugs landing on me eigher. Did you know that Monarch Butterflies can bite?! Just learned that th eother day. HI! 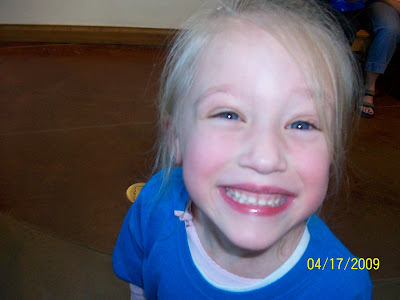 I just came to you through Julie's blog!! What an adorable family you have!! I'll be back to nose around more later! !